The Falcon Heavy test flight (also known as Falcon Heavy demonstration mission) was the first attempt by SpaceX to launch a Falcon Heavy rocket on February 6, 2018 at 20:45 UTC. The successful test introduced the Falcon Heavy as the most powerful rocket in operation, producing five million pounds-force (22 MN) of thrust and having more than twice the lift capacity of the NASA Space Shuttle launch system. In April 2011, SpaceX was planning for a first launch of Falcon Heavy from Vandenberg Air Force Base on the West Coast in 2013. It refurbished Launch Complex 4E at Vandenberg AFB to accommodate Falcon 9 and Heavy. The first launch from the Cape Canaveral East Coast launch complex was planned for late 2013 or 2014. In August 2016, the demonstration flight was moved to early 2017, then to summer 2017, to late 2017 and to January 2018. In December 2017, Musk tweeted that the dummy payload on the maiden Falcon Heavy launch would be his personal midnight cherry Tesla Roadster playing David Bowie's "Life on Mars", and that it would be launched into an orbit around the Sun that will take it as far out as Mars' orbit. He released pictures in the following days. The car has three cameras attached that provided "epic views". The static fire test was conducted on January 24, 2018. Musk confirmed via Twitter that the test "was good" and announced the rocket would be launched in approximately one week. The mission was the test flight of the Falcon Heavy, intended to demonstrate the rocket's capabilities while gathering telemetry throughout the flight. The dummy payload for this test flight was a sports car, Tesla Roadster, owned by Elon Musk. SpaceX stated that the payload had to be "something fun and without irreplaceable sentimental value". Sitting in the driver's seat of the Roadster is "Starman", a dummy astronaut clad in a SpaceX spacesuit. It has his right hand on the steering wheel and left elbow resting on the open window sill. Starman is named for the David Bowie song "Starman". The car's sound system was looping the symbolic Bowie songs "Space Oddity" and "Life on Mars?". It was launched with sufficient velocity to escape the Earth and enter an elliptic orbit around the Sun that crosses the orbit of Mars, reaching an aphelion (maximum distance from the Sun) of 1.66 AU. During the early portion of its voyage it functioned as a broadcast device, sending video back to Earth for four hours. The Roadster remains attached to the second stage. This launcher demonstration made the Roadster the first consumer car sent into space. Three manned rovers were sent to space on the Apollo 15, 16, and 17 missions in the 1970s, and these vehicles were left on the Moon. The Roadster is one of two formerly manned vehicles (albeit not a manned space vehicle) derelict in solar orbit, joining LM-4 Snoopy, Apollo 10's lunar module ascent stage. Also, included was Arch Mission 1.2, which is a crystal disk containing Isaac Asimov's Foundation series of books, on the Tesla Roadster. There is a copy of Douglas Adams' 1979 novel The Hitchhiker's Guide to the Galaxy in the glovebox, along with references to the book in the form of a towel and a sign on the dashboard that reads "Don't Panic!". A Hot Wheels miniature Roadster with a miniature Starman is mounted on the dashboard. A plaque bearing the names of the employees who worked on the project is underneath the car, and a message on the vehicle's circuit board reads "Made on Earth by humans". Falcon Heavy flew in its reusable configuration, allowing for a landing approach of both side boosters and the central core. The side boosters consisted of two previously flown Falcon 9 first stages, being reused from the CRS-9 mission in July 2016 and the Thaicom 8 launch in May 2016. The central core was newly built because it needs to support stronger forces during ascent, so that a regular first stage could not be used. The upper stage was the same as on a Falcon 9. Side boosters equipped with a nose cone have different aerodynamic properties than the usual Falcon 9 boosters with a cylindric interstage. For this reason, SpaceX equipped them with larger and sturdier grid fins made of titanium, to help guide the atmospheric descent accurately. The central core, however, still used conventional aluminum grid fins, as its aerodynamic properties are very similar to those of a conventional Falcon 9 first stage. The Roadster was mounted on the second stage using a custom-made payload adapter, and was encapsulated in a conventional fairing. Falcon Heavy also supports the launch of Dragon capsules without a fairing. relight the upper stage again to put the payload into its heliocentric orbit, demonstrating a lifetime for the upper stage suitable for geosynchronous orbit insertion. The purpose of including the Roadster on the maiden flight was to demonstrate that the Falcon Heavy can launch payloads as far as the orbit of Mars, and it exceeded its projected route by extending its aphelion to near the asteroid belt beyond Mars (with a perihelion at the level of Earth's orbit), but did not test or demonstrate the separation of the second stage and a payload. After a delay of over two hours due to high winds, the launch occurred at 3:45 PM EST, or 20:45 UTC, from Launchpad 39A at Kennedy Space Center at Cape Canaveral, Florida; the Roadster was successfully placed in its orbit, and its two booster cores returned to land at Landing Zones 1 and 2 several minutes later. The sole objective not completed was the landing of the central core; while its fate was initially ambiguous due to signal loss and heavy smoke, Musk confirmed several hours after the launch that the booster had not survived the recovery attempt. Because two of the three engines necessary to land were unable to reignite, the booster hit the water at 500 kilometres per hour, 100 metres away from the drone ship. The final upper stage transfer burn to solar orbit produced an orbit that will be beyond the orbit of Mars at its furthest point from the sun. As the launch was a success, most planned events took place in the planned point of time. As the central core landing burn wasn't performed correctly, the exact time of the landing attempt is not known. In the above table, events are colour coded. Although Elon Musk had publicly declared that there is a 50-50 chance of success, the rocket performed nominally and launched on schedule, followed by nominal separation of the side-boosters (first stage), and soon after, by the central core booster (second stage). Valuable telemetry data on the performance of the launch system and its components were obtained for all stages of the test flight. Both boosters successfully landed almost simultaneously on the ground at Landing Zones 1 and 2 at Cape Canaveral Air Force Station. As the boosters were from an older generation of the Falcon 9 booster, SpaceX has ruled out using any of their major parts for a third mission. Due to the high cost and lengthy manufacturing process of the grid fins, however, those might be reused on future flights. The central core attempted to return to the autonomous spaceport drone ship "Of Course I Still Love You" but failed to light two of the three engines during the landing burn. The core crashed into the ocean 100 metres (300 ft) away from the drone ship at 500 kilometres per hour (300 mph), causing damage to two of the drone ship's station-keeping thrusters. According to Elon Musk on the post-flight conference, the central core ran out of triethylaluminum-triethylborane (TEA-TEB) igniter fluid. Musk later stated that the fix to this problem was "pretty obvious", which led many to believe SpaceX was simply going to add more ignition fluid on future missions. As SpaceX plans to only use Block 5 hardware for future Falcon 9 launches, the Block 3 center core loss does not impact future SpaceX operations. The second stage fired three times before placing the dummy payload in a heliocentric orbit, with an aphelion of 1.70 AU, beyond Mars. The payload has an orbital period of 1.53 years. The first four hours of the flight were streamed live on YouTube. The last image released to the public was taken after the second stage finished burning all of its fuel, and showed Starman leaving Earth behind. Batteries were expected to last about 12 hours. NASA added the second stage to its database for tracking Solar System objects, and it is not expected to make any close encounters with Earth before 2091. The live webcast proved immensely popular, as it became the second most watched livestream ever on Youtube, reaching over 2.3 million concurrent views. Approximately 100,000 people watched the launch from Cape Canaveral. Congratulations @ElonMusk and @SpaceX on the successful #FalconHeavy launch. This achievement, along with @NASA’s commercial and international partners, continues to show American ingenuity at its best! Former NASA Deputy Administrator Lori Garver advocated the cancellation of the Space Launch System program as a consequence of the success of this demonstration. Later, Elon Musk released a video highlighting the flight, and thanking fans. Life cannot just be about solving one sad problem after another. There need to be things that inspire you, that make you glad to wake up in the morning and be part of humanity. That is why we did it. We did for you. ^ Bold entries are core boosters presumed available as active fleet: those which have not been expended, destroyed or officially retired. ^ Entries with colored background and ♺ symbol denote flights using refurbished boosters from previous flights. ^ a b c "Falcon Heavy Demonstration Press Kit" (PDF). SpaceX. February 2018. Archived (PDF) from the original on February 6, 2018. ^ Yuhas, Alan (February 6, 2018). "SpaceX Falcon Heavy launch: world's most powerful rocket blasts off – live". The Guardian. Archived from the original on February 6, 2018. ^ a b Salazar, Doris Elin (February 6, 2018). "SpaceX's Falcon Heavy Rocket: By the Numbers". Space.com. Archived from the original on February 6, 2018. ^ "F9/Dragon: Preparing for ISS" (Press release). SpaceX. August 15, 2011. Retrieved November 14, 2016. ^ Bergin, Chris (August 9, 2016). "Pad hardware changes preview new era for Space Coast". NASASpaceFlight. Retrieved August 16, 2016. ^ Grush, Loren (February 17, 2017). "SpaceX is pushing back the target launch date for its first Mars mission". The Verge. Retrieved February 19, 2017. ^ Clark, Stephen (November 28, 2017). "Debut of SpaceX's Falcon Heavy rocket now planned early next year". Spaceflight Now. Retrieved November 29, 2017. ^ a b Elon Musk (July 19, 2017). Elon Musk, ISS R&D Conference (video). ISS R&D Conference, Washington DC, USA. Event occurs at 36:00–39:50. Retrieved February 5, 2018 – via YouTube. There is a lot of risk associated with the Falcon Heavy. There is a real good chance that the vehicle does not make it to orbit ... I hope it makes far enough away from the pad that it does not cause pad damage. I would consider even that a win, to be honest. ... I think Falcon Heavy is going to be a great vehicle. There is just so much that is really impossible to test on the ground. We'll do our best. ... It actually ended up being way harder to do Falcon Heavy than we thought. At first it sounds real easy; you just stick two first stages on as strap-on boosters. How hard can that be? But then everything changes. [the loads change, aerodynamics totally change, tripled vibration and acoustics, you break the qualification levels on all the hardware, redesign the center core airframe, separation systems] ... Really way, way more difficult than we originally thought. We were pretty naive about that. ... but optimized, it's 2 1/2 times the payload capability of Falcon 9. ^ Wall, Mike (July 20, 2017). "SpaceX's Big New Rocket May Crash on 1st Flight, Elon Musk Says". Space.com. ^ Foust, Jeff (December 2, 2017). "Musk says Tesla car will fly on first Falcon Heavy launch". SpaceNews. ^ Amos, Jonathan (February 6, 2018). "Elon Musk's huge Falcon Heavy rocket set for launch". BBC News. Retrieved February 6, 2018. ^ Grush, Loren (January 22, 2018). "Shutdown means SpaceX can't test its Falcon Heavy rocket, creating further delays". The Verge. Retrieved January 22, 2018. ^ Grush, Loren (January 24, 2018). "SpaceX performs crucial test fire of Falcon Heavy, potentially paving way for launch". The Verge. Retrieved January 24, 2018. ^ Kapatos, Dennis (January 24, 2018). 01/24/2018 – Historic Falcon 9 Heavy Test Fire! (video). Retrieved January 24, 2018 – via YouTube. ^ Musk, Elon [@elonmusk] (January 24, 2018). "Falcon Heavy hold-down firing this morning was good. Generated quite a thunderhead of steam. Launching in a week or so" (Tweet). Retrieved January 24, 2018 – via Twitter. ^ a b c Pappalardo, Joe (February 5, 2018). "Elon Musk's Space Tesla Isn't Going to Mars. It's Going Somewhere More Important". Popular Mechanics. Archived from the original on February 6, 2018. ^ Seemangal, Robin. "SpaceX Successfully Launches the Falcon Heavy—And Elon Musk's Roadster". WIRED. Archived from the original on February 7, 2018. Retrieved February 7, 2018. ^ Hinzmann, Dennis (February 7, 2018). "Elon Musk Sent a Tesla Playing David Bowie to Mars Yesterday". Out Magazine. Archived from the original on February 8, 2018. ^ "Tesla Roadster (spacecraft) (solution #8)". JPL Horizons On-Line Ephemeris System. February 20, 2018. Retrieved February 21, 2018. ^ Harwood, William (February 8, 2017). "'Starman' puts Earth in the rearview mirror". Spaceflight Now. CBS News. Archived from the original on February 8, 2018. ^ Geib, Claudia (December 30, 2017). "The First Car in Space". Futurism, LLC. Archived from the original on January 13, 2018. Retrieved January 14, 2018. ^ "The Apollo Lunar Roving Vehicle". NASA. November 15, 2005. Archived from the original on July 15, 2011. Retrieved May 16, 2010. ^ Ryba, Jeanne (ed.). "Apollo 10". NASA. Archived from the original on July 23, 2013. Retrieved June 26, 2013. ^ "Current locations of the Apollo Command Module Capsules (and Lunar Module crash sites)". Apollo: Where are they now?. NASA. Archived from the original on July 17, 2011. Retrieved December 27, 2014. ^ Clemens, Danny (February 10, 2018). "The SpaceX launch included a small library that could orbit the Sun for millions of years". ABC 30 Action News. Retrieved February 14, 2018. ^ @tiamaria68uk (December 7, 2017). "Will the glove box contain "The Hitchhikers Guide To The Galaxy"?" (Tweet). Retrieved December 8, 2017 – via Twitter. ^ Musk, Elon [@elonmusk] (December 8, 2017). "Yes" (Tweet). Retrieved December 8, 2017 – via Twitter. ^ Musk, Elon [@elonmusk] (December 8, 2017). "Plus a towel and a sign saying 'Don't Panic'" (Tweet). Retrieved December 8, 2017 – via Twitter. ^ "Elon Musk on Instagram: "Printed on the circuit board of a car in deep space"". Instagram. Archived from the original on February 7, 2018. Retrieved April 2, 2018. ^ Lucchesi, Nick (February 6, 2018). "Falcon Heavy Demo Mission Today Will Send Two Used Rockets Back to Space". Inverse. Retrieved February 16, 2018. ^ Grush, Loren (February 6, 2018). "SpaceX launches its powerful Falcon Heavy rocket for the first time". The Verge. Archived from the original on February 6, 2018. ^ Lewin, Sarah (February 7, 2018). "'Crazy Things Can Come True': Elon Musk Reacts to Falcon Heavy Launch Success". Space.com. Retrieved February 16, 2018. ^ Clark, Stephen (February 6, 2018). "Launch timeline for Falcon Heavy's maiden flight". Spaceflight Now. Retrieved February 16, 2018. ^ "Falcon Heavy". SpaceX. November 15, 2012. Retrieved February 16, 2018. ^ "Launch Log". Spaceflight Now. March 17, 2017. Retrieved January 7, 2018. ^ Kyle, Ed. "SpaceX Falcon 9 v1.2 Data Sheet". Space Launch Report. ^ "Table of Falcon 9 Cores". Reddit. Retrieved December 15, 2017. ^ Gebhardt, Chris (April 12, 2017). "Falcon Heavy build up begins; SLC-40 pad rebuild progressing well". NASASpaceFlight.com. Retrieved November 5, 2017. ^ a b O'Kane, Sean (February 7, 2018). "Here's what's next for SpaceX after Falcon Heavy's first flight". The Verge. Retrieved February 7, 2018. ^ Malik, Tariq (February 14, 2018). "Elon Musk Explains Why SpaceX's Falcon Heavy Core Booster Crashed". Space.com. ^ Gebhardt, Chris (November 11, 2017). "SpaceX static fires Zuma Falcon 9; engine test anomaly no issue for manifest". NASASpaceFlight.com. Retrieved November 18, 2017. ^ Gebhardt, Chris. "SpaceX set to debut Falcon Heavy in demonstration launch from KSC". NASASpaceFlight. Retrieved February 6, 2018. ^ Reisinger, Don (February 7, 2018). "Elon Musk's Tesla Missed Mars Orbit After Successful Falcon Heavy Launch". Fortune Magazine. Archived from the original on February 8, 2018 – via Yahoo! Finance. ^ Clark, Stephen (February 6, 2018). "Live coverage: Falcon Heavy blasts off for first time, set for Earth departure burn". Spaceflight Now. Archived from the original on February 6, 2018. ^ Krishna, Swapna (February 6, 2018). "SpaceX confirms it lost the center core of the Falcon Heavy". Engadget. Archived from the original on February 7, 2018. ^ a b Musk, Elon [@ElonMusk] (February 6, 2018). "Third burn successful" (Tweet) – via Twitter. ^ Harwood, William (February 6, 2018). "SpaceX Falcon Heavy launch puts on spectacular show in maiden flight". CBS News. Archived from the original on February 6, 2018. ^ a b Malik, Tariq (February 14, 2018). "Elon Musk Explains Why SpaceX's Falcon Heavy Core Booster Crashed". Space.com. Retrieved February 16, 2018. ^ Wattles, Jackie (February 6, 2018). "SpaceX launches Falcon Heavy, the world's most powerful rocket". CNN Money. ^ O'Kane, Sean (February 7, 2018). "Here's what's next for SpaceX after Falcon Heavy's first flight". The Verge. Retrieved February 16, 2018. ^ Elon Musk celebrates successful Falcon Heavy rocket launch (video). CBS News. February 6, 2018. Archived from the original on February 7, 2018. Retrieved February 7, 2018 – via YouTube. ^ Space X News Conference (video). SpaceX. February 6, 2018. Retrieved February 6, 2018 – via YouTube. ^ "Pseudo-MPEC for 2018-017A". Project Pluto. February 8, 2018. Archived from the original on February 8, 2018. ^ Clifford, Catherine (February 8, 2018). 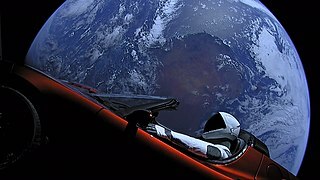 "Elon Musk shares the epic last photo of 'Starman' in the red Tesla he shot into space". CNBC. ^ Coldewey, Devin (February 7, 2018). "Starman has gone dark". TechCrunch. ^ Rein, Hanno; Tamayo, Daniel; Vokrouhlicky, David (February 13, 2018). "The random walk of cars and their collision probabilities with planets". arXiv:1802.04718 [astro-ph.EP]. ^ Singleton, Micah (February 6, 2018). "SpaceX's Falcon Heavy launch was YouTube's second biggest live stream ever". The Verge. ^ Howell, Elizabeth (February 21, 2018). "Facts About SpaceX's Falcon Heavy Rocket". Space.com. Retrieved April 29, 2018. ^ Trump, Donald [@realDonaldTrump] (February 7, 2018). "Congratulations @ElonMusk and @SpaceX on the successful #FalconHeavy launch. This achievement, along with @NASA's commercial and international partners, continues to show American ingenuity at its best!" (Tweet). Retrieved February 9, 2018 – via Twitter. ^ Garver, Lori (February 8, 2018). "SpaceX could save NASA and the future of space exploration". The Hill. Archived from the original on February 9, 2018. ^ Falcon Heavy & Starman (video). SpaceX. March 10, 2018 – via YouTube. ^ Wong, Raymond (March 11, 2018). "Elon Musk drops epic Falcon Heavy launch trailers made by 'Westworld' co-creator". Mashable. ^ Musk, Elon [@elonmusk] (March 10, 2018). "Why Falcon Heavy & Starman? ..." (Tweet) – via Twitter. Wikimedia Commons has media related to Falcon Heavy Flight 1. NASA Kennedy Space Center: "Rocket Launch: February 6, 2018 | SpaceX Falcon Heavy Inaugural Flight"